Bacardi-owned Dewar’s has unveiled its oldest ever whisky release – a 30-year-old blended Scotch confined to the travel retail sector. 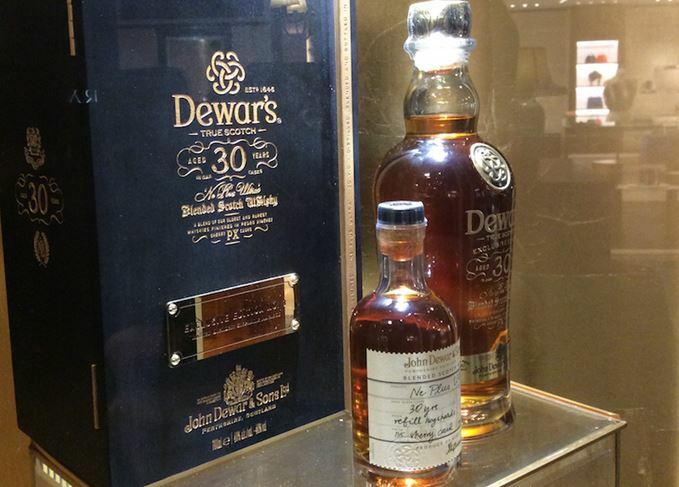 Dewar’s 30-Year-Old Ne Plus Ultra (Latin for ‘the ultimate’) revives a label first used by the company in the early 1900s, and traditionally reserved for its oldest and rarest whiskies. Finished in Pedro Ximénez (PX) Sherry casks, the whisky will be launched in ‘flagship travel retail locations’ on 1 December, priced at SGD688 (US$484) for a 70cl bottle. However, Bacardi Global Travel Retail has made nine numbered bottles available this week in a pre-launch to coincide with the fifth DFS Masters of Wines and Spirits retailer event at Singapore’s Changi Airport. Packaged in a wooden presentation casket and carrying a certificate of authenticity signed by master blender Stephanie Macleod, the nine bottles come with a 20cl sample bottle, enabling purchasers to taste the whisky without opening the main bottle. Ne Plus Ultra features at the DFS T Galleria and in the main DFS store at Changi Terminal 3 until the end of November, retailing at SGD888 (US$625) a bottle. The new DFS store boasts the largest selection of single malts in Asia travel retail. From the US to Asia and the Middle East, the event will offer up to 100 whiskies to taste.